A resident yesterday reportedly pulled out a revolver and threatened a demolition squad of the Municipal Corporation in Sunet village last evening during a drive against encroachments. The city police today arrested a manufacturer for allegedly violating the Copyright Act. It has also registered an FIR against four persons. They have been identified as Tara Singh, his two sons Kulwinder Singh, Rajinder Singh and grandson (of Tara Singh) Rajbir Singh. Rajbir Singh has been arrested while others are absconding. With the administration imposing Section 144 CrPC in Nanaksar Ashram Thath at Siahar following the violence over the headship of the trust, the monthly function routinely organised on the full moon day every month was organised at Nanaksar Ashram in Dhepai village near here today. In order to check the proper utilisation of funds released under the Sarb Sikhya Abhiyan programme and to improve the working of primary schools, a surprise checking was conducted in five Government Elementary Schools by Mr Anurag Verma, Deputy Commissioner, Mr Prem Chand, SDM(E), and Ms Harvinder Kaur, DEO (Primary), accompanied him. With the increasing possibility of early Lok Sabha elections, the aspirants for the ticket of the SAD and the Congress for the Ludhiana Lok Sabha seat have become active. Noted television personality Mandira Bedi will visit three homes in the city on January 10 as a part of the 'Mandira Aapke Ghar' programme being organised by the Set Max channel. Ludhiana happens to be the first city in the country to welcome Mandira Bedi. In a rare occurrence, only one FIR has been registered in the last 24 hours in 17 police stations of the city, which has over 30 lakh residents. On an average, more than 10 cases of different nature are normally registered here as disclosed through the daily crime bulletins available to the media. Khalsa Panchayat has hailed the statement of Mr Gurcharan Singh Tohra, SGPC President, that if the SAD agreed to leave five Lok Sabha seats for its ally, the BJP, it would lay claim on 45 seats in the next Assembly elections. A five-day awareness generation programme to highlight the plight and atrocities committed on women was organised by the Jagraon Citizens’ Welfare Council at Ramgarh Bhullar, 7 km from Jagraon. The tiny-tots of Kiddies Paradise, Kochhar Market, celebrated Lohri in a simple and traditional way. Almost 50 children enjoyed the festival. They sat around bonfire, chatted and shared jokes, enjoyed eatables like reori, gachhak and groundnuts. They listened to the story of Dulha-Bhatti. The kids danced to many Punjabi hit numbers like “kuriye ni saggi phul valiye” and they enjoyed the moments when sang “de maai lohri”. 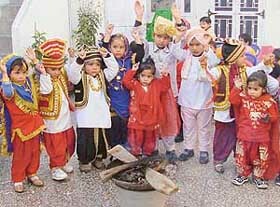 Tine-tots of Kiddies Paradise celebrate Lohri on the school premises in Ludhiana on Thursday. Sify Limited has launched an all-new special offer for international calls using its way2talk facility in Punjab. The way2talk facility, according to a company press note here today, will be available at the Sify i-ways, the country’s largest chain of cyber cafes. A 10-Day NSS special camp jointly organised by the Colleges of Agriculture, Agricultural Engineering and Home Science of the Punjab Agricultural University, got under way at Leerhan village yesterday. About 150 NSS volunteers are participating in the camp. The PAU Vice-Chancellor, Dr K S Aulakh, released the quarterly issue of Mohandra, which is published from Barnala, here today. 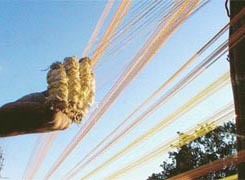 He said language could be developed through the creative literature which should be within the approach of common man. 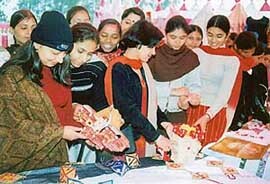 A day-long exhibition of products made by students of Government Institute of Textile Chemistry and Knitting Technology, Rishi Nagar, was organised here today. The exhibition was inaugurated by Mr Sarwan Kumar Sharma of the Nishkam Sewa Kendra, Daad. From the makers of ‘Kaante’, ‘Sur’ ‘Jhankar Beats’ and ‘Mumbai Matinee’ here comes an unforgettable love story starring Kareena Kapoor and Rahul Bose with special performances by Rinke Khanna, Anupama Verma, Mahek Chahal and Yashpal Sharma. This one is Pritish Nandi Communications Ltd’s presentation which will be released on Friday at Malhar and Shingaar Palace, Ludhiana. The Malwa Sabhyacharak Manch will honour seven eminent persons on the annual Lohri festival being organised here on Saturday. Disclosing this here today the office- bearers of the manch , including Mr Jagdev Singh Jassowal, Mr Pawan Dewan, Prof M.S. Cheema, Mr K.K. Bawa and Mr Ravinder Rangowal, said the recipients were identified by screening committee headed by Professor Cheema. Eight teams have confirmed their participation in the inaugural district level hockey tournament (u-14) to be organised by the Youngsters Hockey Revival Club here at the Prithipal astroturf ground of Punjab Agricultural University from January 10 to 12.